Jackalberry camp, a tourist retreat on a peninsula jutting out into the Linyanti River that separates Botswana and Namibia, is finding it difficult to make ends meet. Turning a poor financial situation into something worse are the murders of two guests, one of whom has been mutilated in the style of a revenge killing. Assistant Superintendent ‘Kubu’ Bengu of the Botswana CID is sent to investigate. It turns out that mutilated corpse has died before, having been recorded as slain in the Rhodesian war thirty years previously. The other dead man was an undercover police officer from South Africa. A third man is missing, having left the camp before the bodies were discovered. All of the guests and most of the staff seem to have something to hide and Kubu and his colleagues initially make slow progress. But then the remaining guests start to be murdered and somebody threatens Kubu, seeking to retrieve an impounded item. Something sinister from the past seems to be a play in the present, and if Kubu is to stop and solve the crimes he needs to unravel a deadly set of relations. 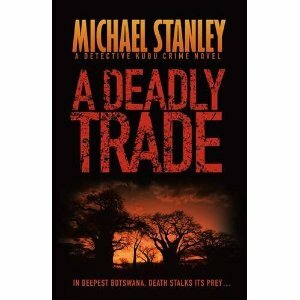 A Deadly Trade is a convoluted puzzle of a police procedural, at the heart of which is the affable and engaging character of Kubu. 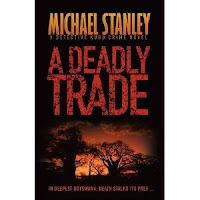 The writing team of Michael Sears and Stanley Trollip are particular good at creating a cast of complex and rounded characters, and the relations between them, and of evoking a strong sense of place as the investigation criss-crosses Botswana. They also do a fine job of portraying the police procedural elements without them detracting from the story. 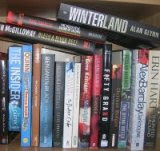 The plot for me is where the book has some niggles. There are effectively three main plots running through the story, along with a host of subplots, and at least one of the main plots could have been dropped, along with a couple of subplots. Red herrings are all well and good, but in terms of credibility for me there can’t be too many of them. Having finished the book a few days ago and now reflecting back on the story, I also find myself left with a handful of loose ends and questions, where things didn’t quite seem to add up. And in general terms the whole thing could do with a bit of tightening up. All relatively minor stuff, but I think created because there were too many threads being interwoven and some scenes were dwelt on rather than limiting the narrative to what was needed. Sometimes less is more. That said, A Deadly Trade is an enjoyable read and Kubu is a delightful character whose company I intend to share in the future. I have my eye out for the first book in the series A Carrion Death.